As a line from this book goes, “It’s the mother of all swears—mother swear!” And it is surely the mother of all entrepreneurial beginnings. Two friends—an enterprising M.B.A. hopeful and a not-quite-an-engineer—dream up a company worth a million dollars on a paper napkin in a dark Bangalore pub, mug of beer in hand. 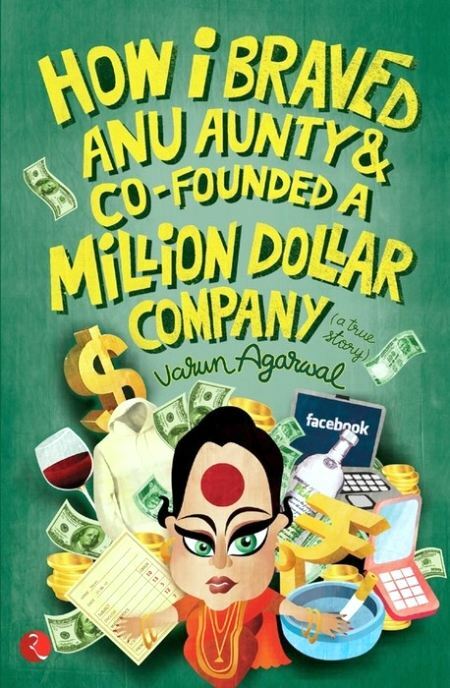 How I Braved Anu Aunty and Co-founded a Million Dollar Company book cover. Varun Agarwal seems like your average Indian youngster: fresh out of college, an engineering graduate who’s not really into engineering, looking for a job without really knowing what he’s looking for. What sets him apart from the rest of us is one simple fact—he founds a company that is worth a million dollars. How I braved Anu Aunty and Co-founded a Million Dollar Company is not a book that will appease critical eyes—just as its author says right at the beginning, this is no work of Ernest Hemingway. And ironically, that’s where the charm of this book lies: in its sheer simplicity and the engaging style in which the author captures the reader’s attention. Thanks to the openness with which Varun Agarwal begins the retelling of his journey—starting from the confines of his home to 1,000 fans on Alma Mater’s Facebook page—there’s no putting down this book. There is no concrete storyline, no deep plot to analyse; this is just pure storytelling, as if he were sitting across the table from you, beer in hand. In a sense, one may view this as a marketing manual and a whacky one at that—not often do you get to look at kitty parties and Indian aunties as valuable market research and branding tools. For everyone who’s looking for that extra push towards avoiding traditional professional avenues and following their dreams instead, this is a highly recommended read. Rather than bore the reader with unnecessary details or awkwardly long monologues, Varun manages to keep reader interest at an almost constant high throughout the duration of the book. Of course, this is a book that is aimed at a more ‘chilled out’ audience, but it is surely one that will plant a wide smile on the faces of most people who pick it up. Click here to purchase How I Braved Anu Aunty… online. Tasha is a second year media trainee at the Symbiosis Institute for Media Communication. A big foodie, she is an avid reader, loves cartoons, and a good laugh every now and then. She likes to write sporadically and absolutely loves jazz and country music. Small world. I know his brother!